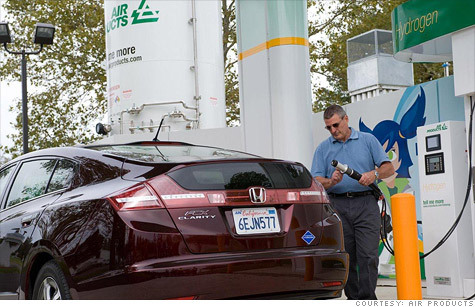 Hydrogen fuel cell cars, like the Honda FCX Clarity, have advantages over other electric cars, but finding a place to fill one up can be tough. NEW YORK (CNNMoney) -- Imagine an electric car that can be charged in about the time that it takes to fill a gasoline tank and which can then drive hundreds of miles. This is not a fantasy scenario. In fact, that pretty much describes the hydrogen fuel cell cars several major auto manufacturers, including Toyota (TM) and Hyundai, plan to have for sale. While those automakers will introduce the cars in small numbers and in limited markets, by 2015 or so, Honda and Mercedes-Benz are already leasing hydrogen fuel-cell powered cars to customers in Southern California. General Motors (GM, Fortune 500) also has about 100 fuel-cell powered crossover SUVs in customer hands. Some of GM's fuel cell vehicles are also being used by the military. Hydrogen fuel cell cars are electric cars but, instead of storing electricity in a batteries, they generate it on board in fuel cells. The fuel cells combine hydrogen gas with oxygen in a process that creates water and a stream of electricity. That electricity powers the car -- but without the long charging times. California's zero-emission vehicle sales requirements account for much of why automakers are interested in providing hydrogen vehicles. Meanwhile, initiatives in Washington to broaden financial support for alternative fuel vehicles could help off-set some of the additional costs. But there remain two big challenges to a more wide-scale availability of these types of cars. First, hydrogen fuel cell cars are expensive. "The systems will cost more than many of the other powertrains that are out there today because these are first generation technologies," said Charles Freese, who heads hydrogen vehicle development for GM. The good news is that they are, at least, much less expensive than they used to be. Both General Motors and Toyota say that they've chopped the cost of building their experimental fuel cell vehicles down to a tenth of what it used to be. So that means that vehicles that used to cost $1 million to build a few years ago now cost $100,000. That's still way too much for commercial viability. Toyota sees further cost cuts on the horizon before it begins selling its hydrogen-powered sedan in 2015. "The target is in the $50,000 range in order to interest enough customers to make the thing work," Toyota spokesman John Hanson said. Fill 'er up! But Where? The other big problem for hydrogen cars is "infrastructure" which, in this case, means hydrogen filling stations. Bottom line: If you don't live near Los Angeles, you'll probably have a tough time filling up. "The earliest the infrastructure becomes viable is 2015 or 2016," said GM's Freese, "and that's debatable." At least the fuel itself isn't hard to locate. It is, literally, everywhere. Hydrogen is the most abundant element in the universe. But, ordinarily, it doesn't just float around by itself. It has to pried out of molecules like those of water or natural gas. One way to do that is with electricity, but that's not how the vast majority hydrogen is produced, said Ed Kiczek, who heads hydrogen systems for Air Products, the largest provider of hydrogen gas. (Air Products builds hydrogen fueling stations in addition to providing the gas for a variety of industrial uses.) Most hydrogen gas is produced by burning natural gas to heat up a mixture of natural gas and water. "We could power over 200,000 vehicles just using waste gases from the chemical industry," said Sascha Simon, head of advanced product planning for Mercedes-Benz. John DiCicco, an auto analyst with Environmental Defense Fund, remains unconvinced that hydrogen-powered cars will make it in the real-world anytime soon. Alternative-fuel advocates, he points out, tend to compare idealized future visions of their favorite technology -- scenarios in which all the challenges have been resolved -- to today's gasoline-powered cars. The trouble is that, while hydrogen cars and plug-in cars will improve, so will gasoline cars, DiCicco said. In the end, more fuel efficient, cleaner-burning gasoline vehicles could leave car buyers little reason to embrace more expensive exotic technologies. Someday hydrogen's time may come, DiCicco said. But not as soon as 2015 or 2016. "I look at it as one of several promising promising long term options for fueling cars and trucks," he said.